India's abandoned step wells are an important part of the country's history and architecture. Although information about them is scarce, they're believed to have started appearing mostly between the 2nd and 4th centuries. In addition to supplying water from the country's deep water tables, they provided shade and were used as temples, community centers, and layovers on trade routes. 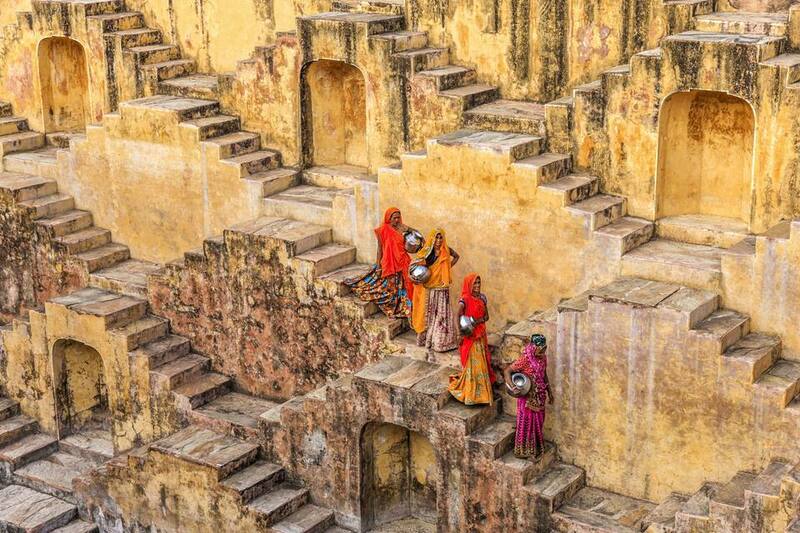 Most of the step wells can be found in the hot, dry states of northern India -- particularly in Gujarat, Rajasthan, and Haryana. No one knows how many there are, or how many there used to be. Before the British came to India, there were reportedly several thousand. However, they lost their purpose after plumbing and taps were installed, and many were subsequently destroyed. The step wells, known as vavs in Gujarat and baolis (or baoris) elsewhere in northern India, are remarkable both in their engineering and architecture. Each is different, with variations in shape (round, square, octagonal, and L-shaped) and number of entrances, depending on their environment. Yet, sadly, most step wells are neglected and crumbling. Read on to discover some that are well-maintained and worth visiting. Rani ki Vav (the Queen's Step Well) is undoubtedly India's most awe-inspiring step well -- and this UNESCO World Heritage site was only discovered relatively recently. The step well dates back to the 11th century, during the reign of the Solanki dynasty, when it was apparently constructed in memory of ruler Bhimdev I by his widowed wife. Up until the late 1980s, it was flooded by the nearby Saraswati River and silted over. When it was excavated by the Archeological Survey of India, its carvings were found in pristine condition. What a discovery! There are more than 500 main sculptures and 1,000 minor ones on the panels of the elaborate and showy step well, which was designed as an inverted temple. Astonishingly, no stone is left uncarved! A highlight are the galleries dedicated to Lord Vishnu, containing hundreds of intricate figurines depicting his 10 avatars. They're accompanied by captivating carvings of other Hindu gods, celestial beings, geometric patterns, and flowers. Apparently, there was even an escape route for the royal family on bottom level of the step well, said to connect to the Sun Temple in Modhera. How to Get There: Rani ki Vav is one of the top attractions in Gujarat. It's located in Patan in northern Gujarat, around 130 kilometers from Ahmedabad. Entrance Fee: 15 rupees for Indians, 200 rupees for foreigners. Off the beaten track, the magnificent but rather eerie Chand Baori (Moon Step Well) is India's deepest step well. It extends approximately 100 feet into the ground, down 3,500 steps and 13 levels. This square step well was built between the 8th and 9th centuries by King Chanda of the Nikumbh dynasty of Rajputs. However, locals will tell you a more spookier story of it being constructed in one night by ghosts! The well features a series of royal pavilions, with resting rooms for the king and queen, atop each other on the north side. They're surrounded by zigzagging steps on the other three sides. There's also a partially-destroyed temple, dedicated to Harshat Mata (the goddess of happiness), adjoining the step well. If you're a movie buff, you might recognized the step well from Batman movie The Dark Knight Rises or lesser-known The Fall by Tarsem Singh. An two-day festival takes place every year in September in Abhaneri, against the evocative backdrop of Chand Baori, to promote rural tourism. It features cultural performances from a number of states across India, Rajasthani song and dance, puppet shows, camel cart rides, and a fairground. How to Get There: The step well is located in Abhaneri village, in the Dausa district of Rajasthan, between Agra and Jaipur on the Jaipur-Agra Road. It's best visited on a day trip due to the absence of accommodations there. The elegant five-story step well at Adalaj near Ahmedabad in Gujarat was completed in 1499, after Muslims made Ahmedabad their first Indian capital. Its history is unfortunately mired in tragedy. Rana Veer Singh, of the Vaghela dynasty of Dandai Desh, started constructing the step well in 1498 for his beautiful wife Rani Roopba. However, he was killed in war by invading King Muḥammad Begda (the Muslim ruler of a neighboring kingdom) and the well was left incomplete. King Muḥammad persuaded the widowed Rani Roopba to marry him, on the condition that he'd finish the well. After it was built, she committed suicide by jumping into it. The step well's superb Indo-Islamic architecture represents a fusion of Islamic floral patterns with Hindu gods and symbolism. The walls are adorned with carvings of elephants, mythological scenes, women performing everyday chores, and dancers and musicians. Highlights are the Ami Khumbor (pot containing the water of life) and Kalp Vriksha (tree of life), made out of a single slab of stone. How to Get There: The step well is located 18 kilometers north of Ahmedabad in the Gandhinagar district of Gujarat. Dada Hari is similar in structure to the more famous Adalaj Step Well. It was completed in Ahmedabad a year later, in 1500, by Muḥammad Begda's harem supervisor Sultan Bai Harir (locally known as Dada Hari). The step well's spiral stairway leads down seven levels, past ornate pillars and arches, and the deeper you go the better the condition of the sculptures. Both Sanskrit and Arabic inscriptions engraved on the walls are still visible. Visit in the late morning when light shines down the shaft. How to Get There: The step well is located on the eastern side of the Ahmedabad Old City in Asarva, a little to the south west of Asarva Lake. It's not well-known or frequently visited, so take an auto rickshaw and get the driver to wait. Agrasen ki Baoli, Delhi's most popular step well, is flanked by high-rises and tucked away in the unlikely heart of the city near Connaught Place. It's more of a hangout for college kids (and bats and pigeons) than tourist attraction. However, it did get its moment of fame in Bollywood movie PK. No one really knows who built the 60 meter long step well. It's commonly said to have been constructed by King Agrasen during the Mahabharata period and then later rebuilt in the 14th century by the Agrawal community, who are descendants of the King. Restoration works have also been undertaken in recent years to maintain the step well. The step well's 100-plus stairs used to be submerged in water. These days it's completely dried up and you can walk down, past the chambers and passageways, to the deepest point. How to Get There: The step well is located off Hailey Road, near Kasturba Gandhi Marg. The nearest Metro train station is Barahkhamba Road on the Blue Line. If you're exploring the monuments scattered around lush Mehrauli Archaeological Park, don't miss visiting Rajon ki Baoli deep inside the park. According to its inscription, it was built in 1512 by Daulat Khan Lodi during the reign of Sikandar Lodi. However, it gets its name from the rajon (masons) that occupied it in the early 1900s. Daulat Khan also built an impressive mosque adjacent to the step well and was buried in its courtyard when he died. Situated nearby, you'll find another step well -- the comparatively plainer Gandhak ki Baoli. How to Get There: The step well is located around 700 meters northwest of Jamali Kamali tomb in Mehrauli Archaeological Park, in south Delhi. It's opposite Qutab Minar Metro Station, Anuvrat Marg, Mehrauli. Toorji ka Jhalra is situated in the heart of Jodhpur's Old City, where it's one of the top attractions. This sandstone step well was built in the early 18th century by the wife of Maharaja Abhay Singh but was sadly neglected (submerged and filled with garbage) up until recently, when it was revived as part of the JDH Urban Regeneration Project. The project was led by the owners of the nearby RAAS boutique heritage hotel, and the step well's restoration is heralded as a remarkable example of urban rehabilitation. Stay in the hotel's coveted Step Well Suite and you'll get a direct view over the monument. The area around the step well has also been transformed into what's now called Step Well Square. It features contemporary cafes and shops housed in the heritage buildings. Step Well Cafe has the same owners as RAAS and provides an outstanding view over the step well for those that don't have the budget for the Step Well Suite. How to Get There: Toorji ka Jhalra is about a 10 minute walk south of Mehrangarh Fort in Jodhpur, via Fort Entrance Road. This little-known step well is usually overlooked by tourists visiting the much more famous Amber Fort near Jaipur, as it's located on the rear side of the fort. However, those who are fortunate enough to find out about it and make the effort to see it are rewarded with architecture that's comparable to Chand Baori in Abhaneri. If you've seen The Best Exotic Marigold Hotel, you may recognize Panna Meena ka Kund from one the scenes in the movie where Dev Patel woos girlfriend Tena Desae. Not a lot of information is available about the step well's history, although it's said to be about 450 years old. There's a old disused 16th century temple next to it. How to Get There: Follow Amer Road around to the back of the fort. It is situated close to Anokhi Museum near Kheri Gate. Unlike other step wells, the unusual step well at Jaipur's Nahargarh Fort is unsymmetrical and follows the natural terrain of the hill. It's part of an extensive catchment system that was made to provide water to the fort, built in 1734 by Maharaja Sawai Jai Singh II (who founded Jaipur). The catchment system has a network of small canals in the surrounding hills to collect rainwater and feed it into the step well. This step well has also appeared in movies -- most notably, the 2006 Bollywood hit Rang De Basanti. If you'd like to learn about the step well in detail, join this informative Nahargarh Water Walk conducted by Heritage Water Walks. How to Get There: Nahargarh is situated north of the Jaipur city center. It can be reached by a steep half hour trek directly up the hill at the bottom of Nahargarh Road, or indirectly by road through Amber. To reach the step well, go left before entering the fort. Entrance Fee: Tickets are required to go inside the fort. If you haven't purchased a composite ticket, which covers most Jaipur monuments, the cost is 50 rupees for Indians and 200 rupees for foreigners. Traveling to Hampi from Hubballi? Make sure you stop off at this obscure yet exquisite 12th century step well. The village of Lakkundi, where it's located, has many ruined temples and step wells from this time period when construction by Chalukya rulers reached its peak. The step well, known as Muskin Bhanvi, is connected to Manikesvara temple. The structure actually extends outwards from underneath the temple, and there are several shrines within its steps. An annual two-day Lakkundi Utsav cultural festival takes place every year in the village to promote the wells and temples. How to Get There: Lakkundi is about an hour and a half from Hubballi and two and a half hours from Hampi, via National Highway 67. Shahi Baoli, the royal step well, is part of the imposing 18th century Bada Imambara complex. The complex was built by Asaf-ud-Daula, the Nawab of Awadh, as a ceremonial prayer hall for Muslims. It was designed by Mughal architect from Delhi. The step well is connected to the Gompti River, and said to have been made as a reservoir to provide water during the complex's lengthy construction. It was later turned into a royal guesthouse and living quarters, resplendent with fountains and marble floors. According to legend, an employee who held the keys to the Nawab's house of treasure jumped into the well to escape the British and prevent them from looting the treasure. The step well's unique architecture apparently provided a secret view of visitors as they entered from the main gate, as their reflections were visible in the well's water. The geometry of the well's repeated arches is also distinctive. How to Get There: Shahi Baoli is located on the eastern (right) side of the Bada Imambara complex, which is a prominent historical attraction in Lucknow. Entrance Fee: Tickets cost 50 rupees for Indians and 500 rupees for foreigners, for the whole complex. Separate tickets can be purchased solely for the step well. The cost is 20 rupees for Indians and 200 rupees for foreigners.